Everyone who flees from what is superficially good and follows what is reckoned hard and foolish finds happiness awaiting him. Justin Martyr, also known as Justin the Philosopher and Saint Justin (c. 100 – 165 AD), was an early Christian apologist, and is regarded as the foremost interpreter of the theory of the Logos in the 2nd century. 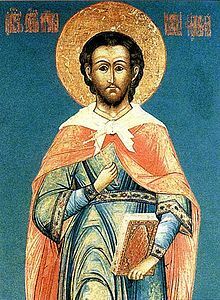 He was martyred, alongside some of his students, and is considered a saint by the Roman Catholic Church, the Anglican Church, and the Eastern Orthodox Church. ...we who valued above all things the acquisition of wealth and possessions, now bring what we have into a common stock, and communicate to every one in need; we who hated and destroyed one another, and on account of their different manners would not live with men of a different tribe, now, since the coming of Christ, live familiarly with them, and pray for our enemies, and endeavour to persuade those who hate us unjustly to live conformably to the good precepts of Christ, to the end that they may become partakers with us of the same joyful hope of a reward from God the ruler of all. The demons have always effected that all those who ever so little strived to live by logos and shun vice be hated. Virtue, who was of squalid look and dress, said, if you obey me you will adorn yourself not with ornament nor beauty that passes away and perishes, but with everlasting and precious graces. And we are persuaded that everyone who flees from what is superficially good and follows what is reckoned hard and foolish finds happiness awaiting him. For Vice, veiling her actions in the beauties which properly belong to Virtue and are genuine, enslaves groveling people. This page was last edited on 26 January 2019, at 21:35.